The death of a 15 year - old in central Athens during clashes with police in the Exearchia district has sparked off a series of violent protests in the Greek capital and other major cities. 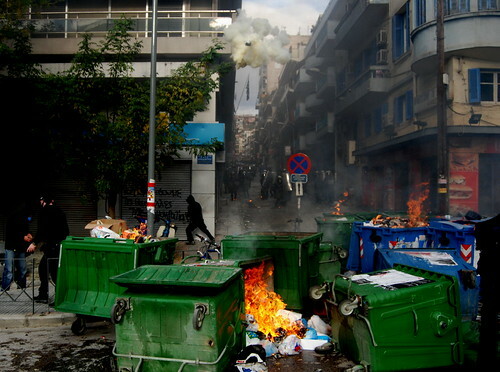 Thessaloniki, Patras, and Crete all witnessed violent clashes between demonstrators and riot police. According to official reports Andreas Grigoropoulos died after being shot at 9pm by police guarding the Exarcheia police station, which due to its proximity to the university of Athens is often a target for attacks by anarchist and other leftist groups. News of the death quickly spread via the internet, SMS and word of mouth leading to protests across Greece. Today's marches quickly turned violent as enraged demonstrators took our their anger on banks, shops and police stations. In Thessaloniki, Greece's second city the central Leukos Pyrgos police station was attacked by masked anarchists with rocks and Molotov cocktails. The police replied with tear gas and flash grenades causing panic and chaos amongst the thousands of marchers not involved in the violence. TV images being shown live on Greek TV show central Athens swathed in smoke and tear gas and tens of small fires burn unattended as the fire fighters are unable to put them out. The events couldn't have come at a worst time for the conservative New Democracy government which has been losing support due to its handing of the recent economic crisis and the alleged involvement of many senior officials in the Vatopedi corruption scandal.